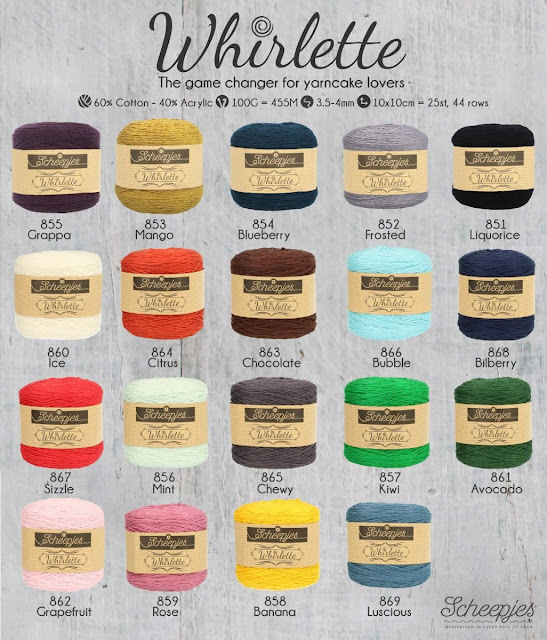 In my previous post, I showed you the Whirlette yarn I got for a new exciting project. I say exciting because I'm in the middle of designing something I've never tried before. If you look at the picture above, it won't be any surprise that I'm trying my hand at designing a shawl, or rather a wrap because the shape is just perfect for enveloping yourself in very snuggly. 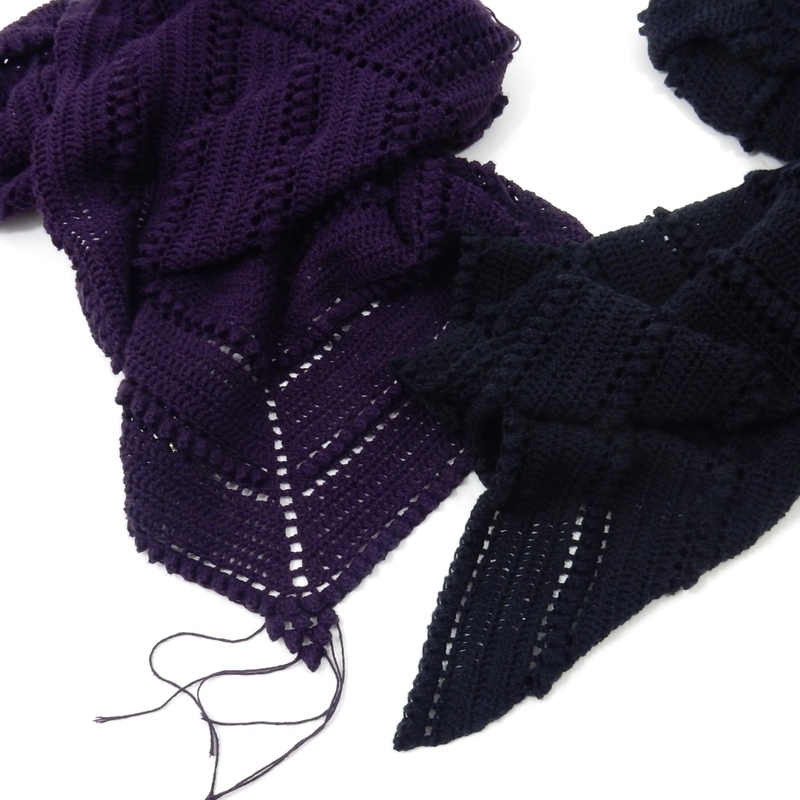 I know there are already a gazillion crochet patterns out there for shawls, wraps and scarves. It's very difficult I think to come up with something new and original. That's why I decided not to spend hours browsing Ravelry or Pinterest to make sure that my wrap would be completely different. I knew what I wanted from my wrap, so I was determined not to let myself be distracted by all the beautiful creations online. And there are other ways to stand out a bit - yarn choice, colour choice, hook size even - and of course every designer has their own special idiosyncrasies anyway. So I got started on my wrap. This is what I had in mind: I wanted a dense fabric, something to keep my neck and shoulders warm without having to wrap a shawl around my neck a few times. I pictured myself wearing it mainly around the house: working on my computer and watching TV and crocheting at the same time. I also preferred a single colour. Although I love all the variegated yarn that's so popular - like e.g. 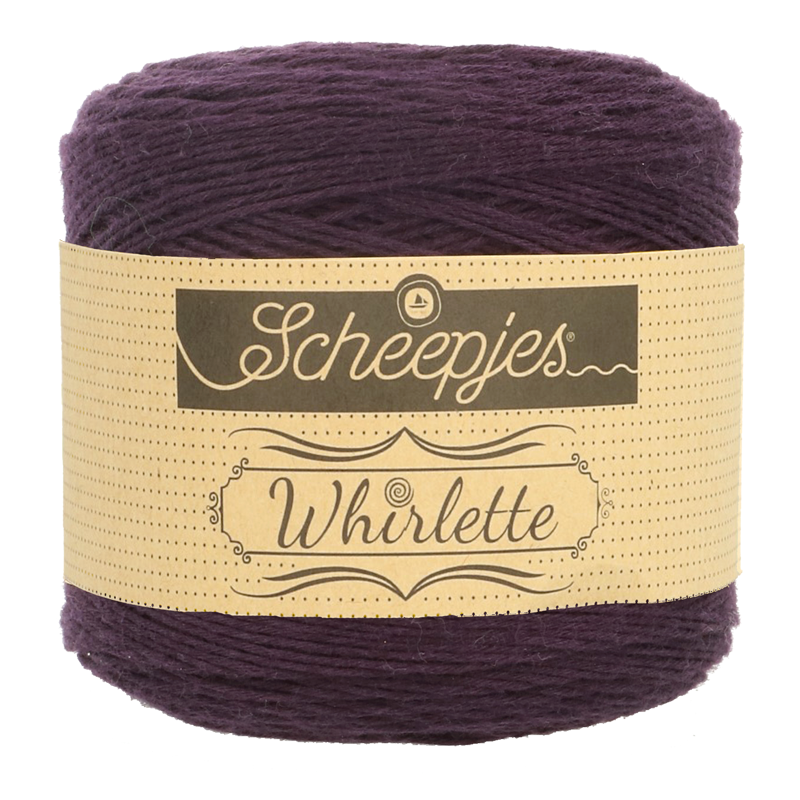 Scheepjes Whirl - I'm more of a single colour girl. I wear mainly black - yes, I still have New Wave style in my blood - but autumny type colours do occasionally creep in: burgundy, ochre, green, purple, teal. A bit of texture was also on my list, so popcorns had to be part of it too. And most important of all.....I needed a relaxing, mindless project. Not a lot of counting, lots of repetitions. My wraps are well under way! Yes, plural: wraps. I started making one in Grappa ( a lovely deep purple shade) but when my mum saw it, she immediately called dips on it and I have to say the colour suits her so well. She's very tiny so I finished wrap number 1 very quickly. I couldn't help myself and tried to add a quirky detail to the edge, but I'm not sure whether it will make it to the final pattern. What do you think? In or out? Quirky detail at bottom edge. So that left me without a wrap for myself.....so I had to make a black one as well! Since I'm a lot taller than my mum, I started on a Size L for myself. I love working on it. 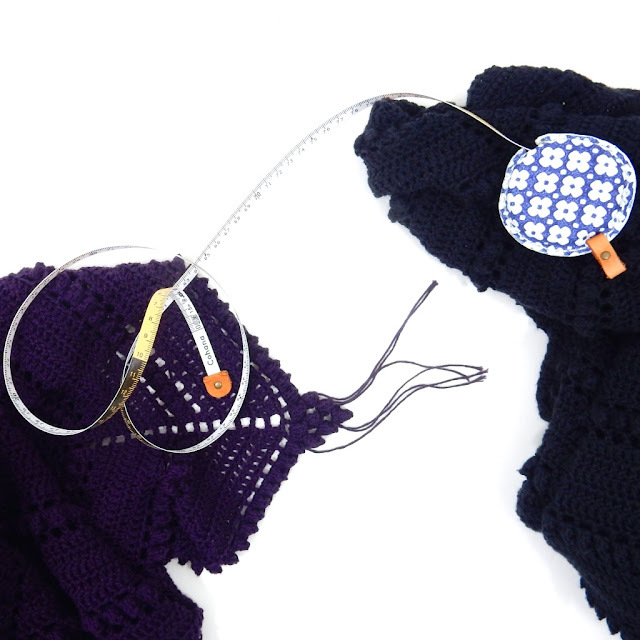 I'll show both wraps in full very soon and the pattern will be free and available here on my blog in a few weeks' time. 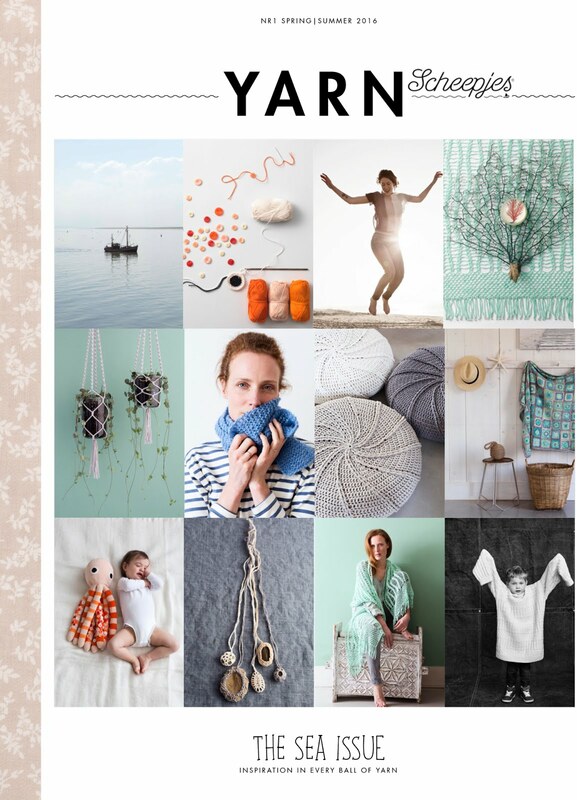 In the meantime, below you'll find all the yarn details and info on where you can shop for it. I made two different sizes: S and L. Still have to measure them but the L is so big! Love it! The Whirlette yarncakes are 60% cotton and 40% acrylic, which makes for a wonderful breathable fabric and thus very suitable for wraps, shawls, scarves and garments like cardigans. 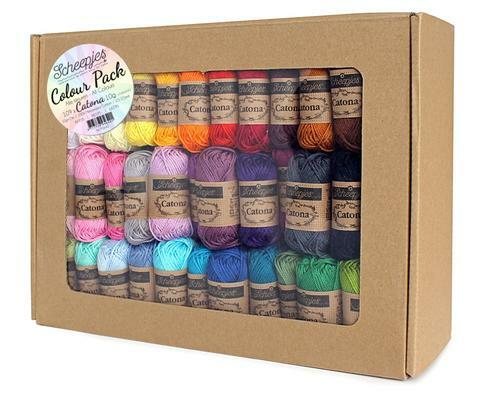 The 100g cakes have 455 metres of soft and supple yarn and a 3.5mm crochet hook is perfect for it. And there are 19 shades! *Thanks to Scheepjes, who supplied the yarn for me to use. As always, any opinions expressed are my own. The affiliate links in this post support giveaways, free patterns, discounts and the running of this blog. 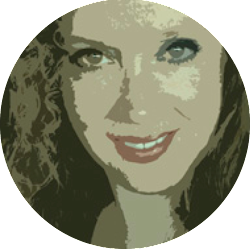 By purchasing yarn through these affiliate links, I will receive a small commission at no extra cost to you. Thank you! Today I received some lovely yarn for a new project I actually designed quite a while ago. The design is a bit out of my comfort zone, but at the same time I'm also looking forward to finally making it. 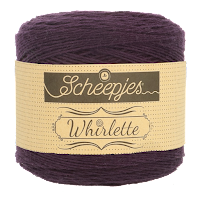 The yarn that's just perfect for my project is Scheepjes Whirlette, Whirl's little sister in single colours. 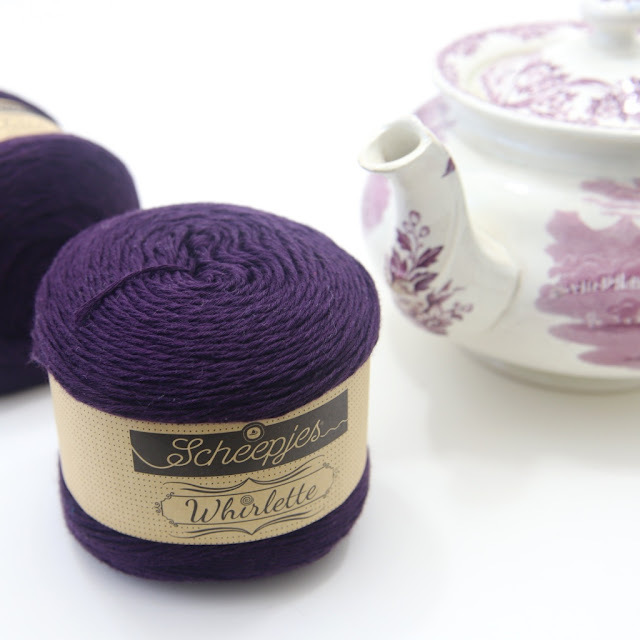 I think I can assume that quite a few of you are already familiar with Scheepjes Whirl, the gorgeous variegated yarn cakes so popular for shawls and wraps. Whirlette was made as a uni colour companion to it and since I've seen very few projects made in Whirlette only, I thought let's use this yarn for my design (see below for more yarn info). I won't reveal the details of what I'm going to make just yet, but it's definitely wearable (but I'm sure you can guess, can't you?). And as you may be wondering why there's a teapot in the picture above......let me explain: I really wanted to work on a relaxing project, one without a lot of counting, so that I can drink lots of tea and perhaps watch a bit of TV at the same time. So that's what I'm going to do this week and I will show you some progress shots next Monday. 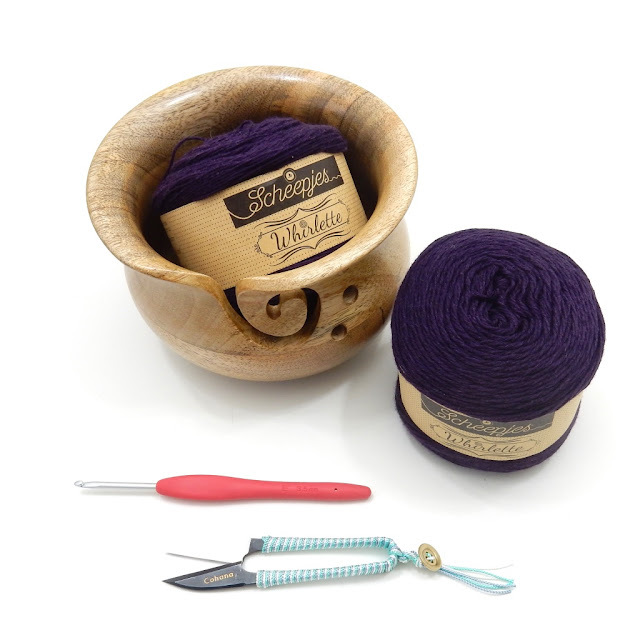 I always use a yarn bowl to keep my yarn from rolling across the carpet - I don't want any hairs in my projects :-) and since I love a pair of cute scissors, I got a Cohana thread cutter with a lovely silk-braided handle (it's called Shozaburo and Black Sheep Wools sells a variety of Cohana items). *Thanks to Scheepjes, who supplied the yarn for me to use. As always, any opinions expressed are my own. The affiliate links in this post support giveaways, free patterns, discounts and the running of this blog. 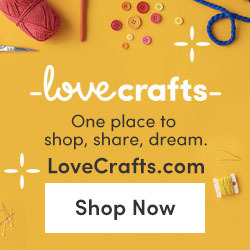 By purchasing yarn through these affiliate links, I will receive a small commission at no extra cost to you. Thank you! Scheepjes CAL 2018 to start 12 September! Have you heard the news yet? 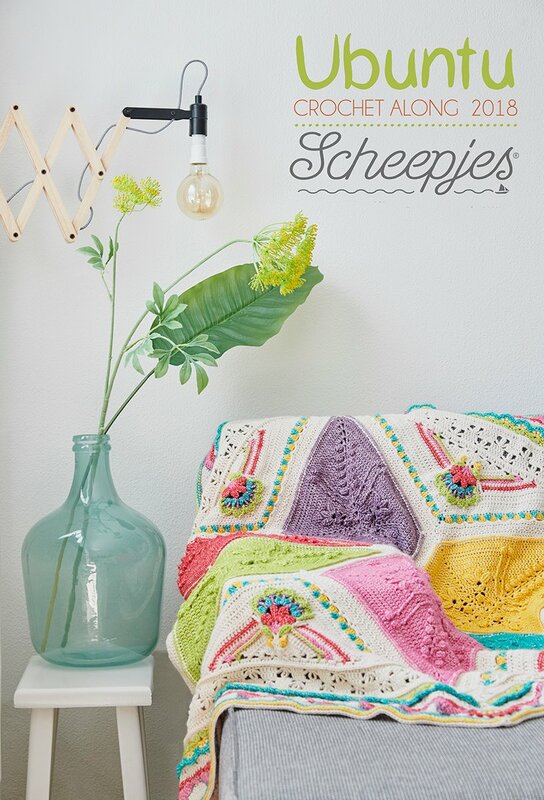 The new Scheepjes Crochet Along is going to start very very very soon....the kick-off is on the 12th of September! I'm so excited. 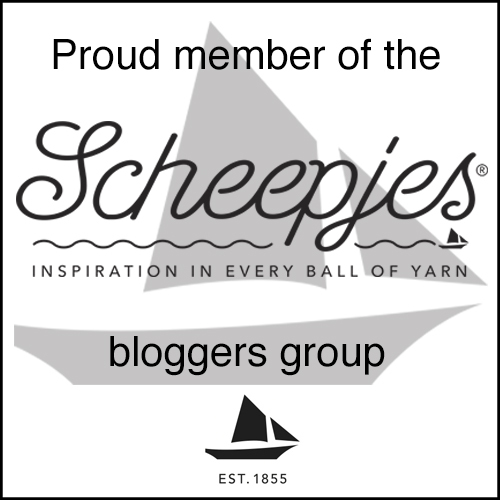 It's such an amazing community event that allows you to crochet along with so many other enthusiastic crocheters in the official Scheepjes Facebook group. It's just wonderful to read about everyone's experiences and see the projects grow week by week. Do you plan to join in? If so, I'll give you all the details below, but not before I've sung the praises of the CAL's super talented and dedicated designer Dedri from Lookatwhatimade. Some of you may already be very familiar with Dedri's work. 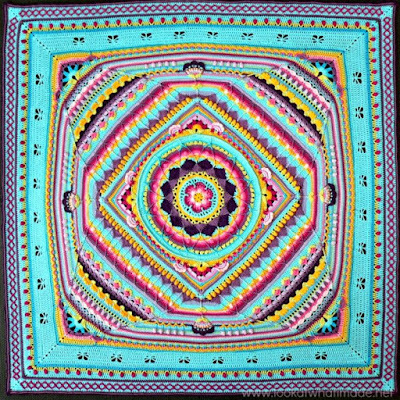 A few years ago she designed the gorgeous Sophie's Universe blanket that you can still come across on social media on a regular basis. 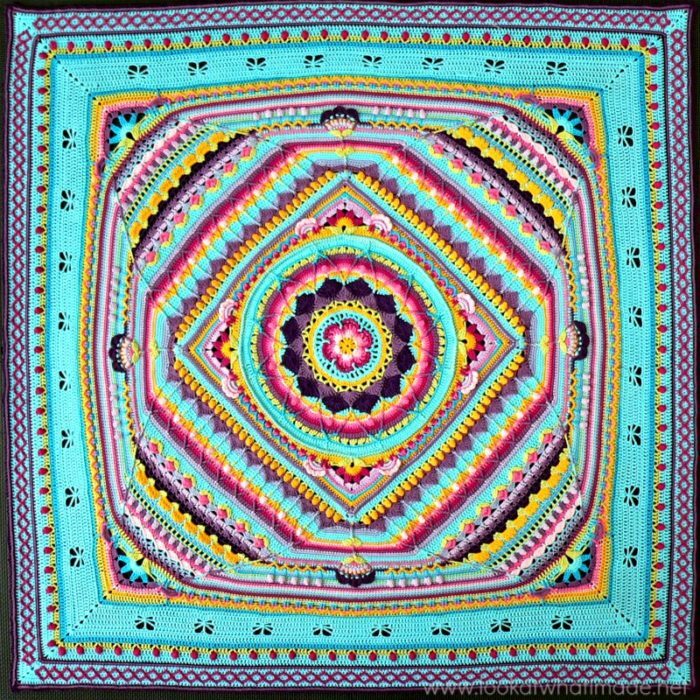 This blanket design encouraged so many crocheters to step out of their crochet comfort zone and try new stitches and work on a relatively large project. I'm sure that will be the case again with her stunning new design: the Ubuntu blanket. It's a hexagonal blanket with a large star at its centre. I guess you'll be wondering about the name. This is how Dedri explains why she chose this name: "The word Ubuntu is a Nguni Bantu term meaning “humanity towards others” or “I am because we are”. Through Crochet-alongs, I have found a community that constantly reminds me of the essence of Ubuntu: connection, community, and mutual caring for all. We wanted to honour and celebrate that in this CAL, both in the design and how we choose to engage with each other as we embark on this journey." It is so wonderful that this project is not just about getting your yarn out and working towards the finished product. It's about engagement, so it might be a good idea to become a member of the official Facebook group for connection, support, inspiration and fun! You'll find the relevant links below. Details: Kits, Blanket photos, Timeline, etc. 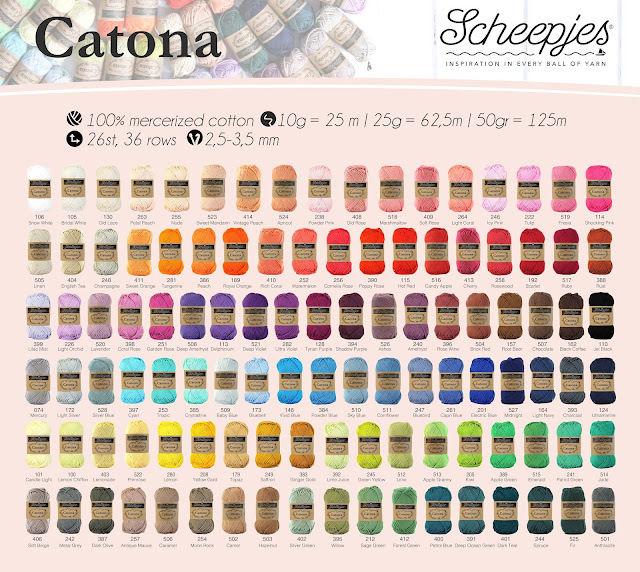 Now it's time to give you all the details on the CAL, starting with information about the kits (all the yarn you need to make the blanket with a few free gifts thrown in) and lots of photos! 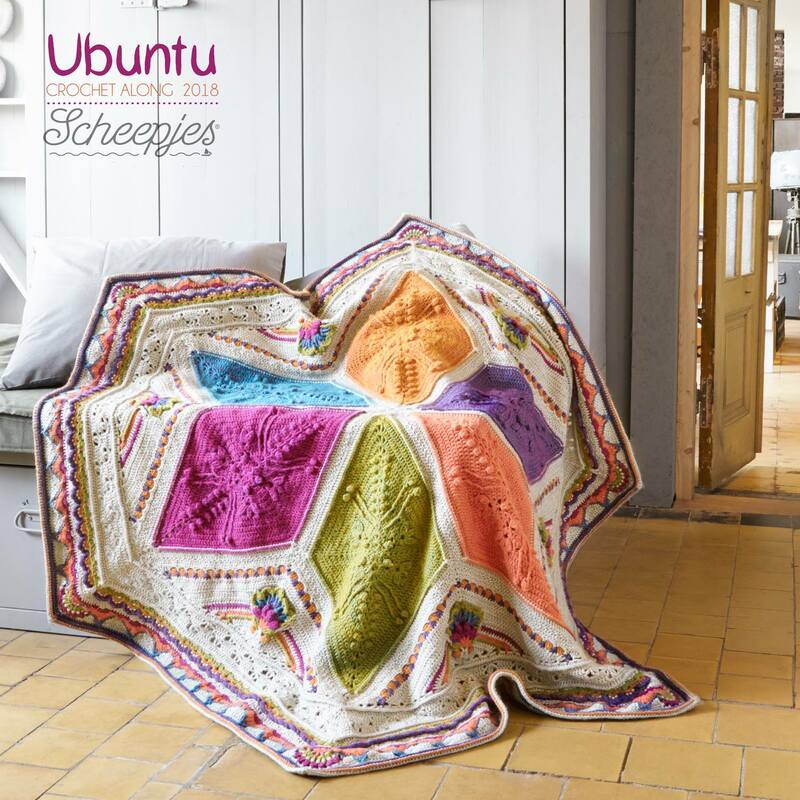 You can buy kits for 3 different sized blankets: *Small Kit: 120 x 104cm in Cotton 8 yarn. *Medium Kit: 151 x 131cm in Stone Washed. 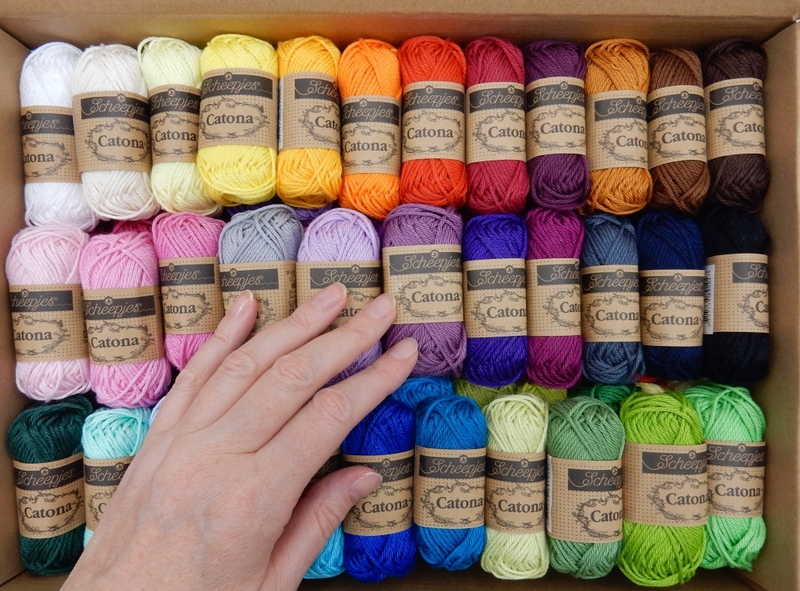 All kits contain an official Ubuntu CAL label and button, and a set of vintage stitch markers. The large and medium kit also contain a beading loom and everything you need to make a friendship bracelet designed especially for this CAL by Dedri herself. See the links below to order your kit! Small size in Cotton 8. Look at those details! Have you been able to make a choice yet? I really love the largest size (see photo at the beginning of this post) because the texture is so pronounced. I've you'd like to browse the 3 different kits and perhaps buy one, you'll find them here. The CAL will begin on Wednesday the 12th of September and will run for 12 weeks, ending the beginning of December. Kits will be available from 22 August. Be quick, they sell out fast. 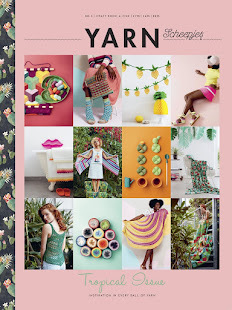 Each pattern piece will be made available as a downloadable pdf on Wednesdays 13:00 Dutch time / 12:00 UK time. 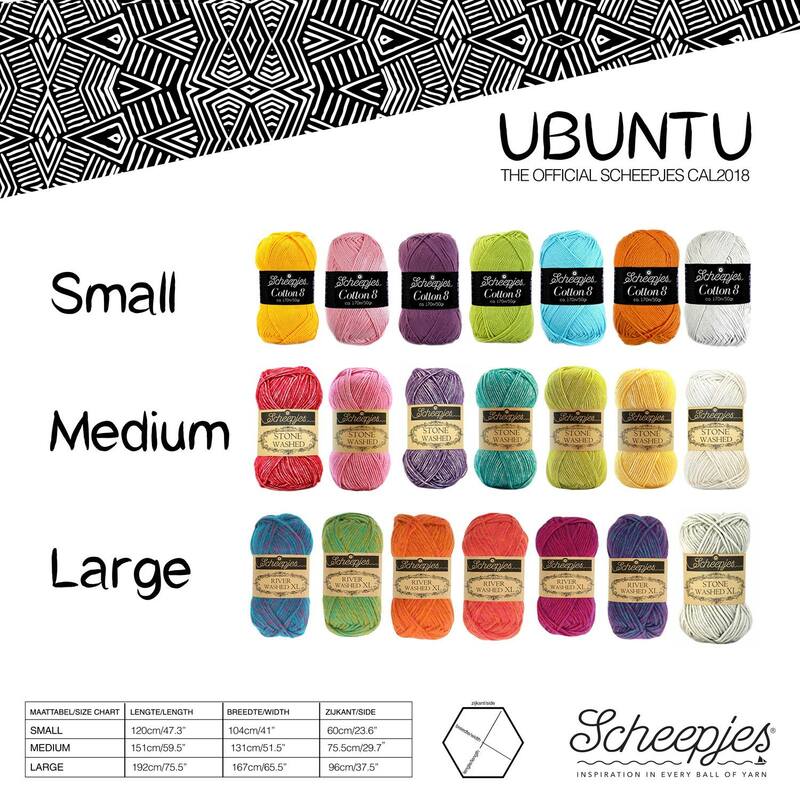 You can access these from the official Scheepjes Facebook Group or via the Scheepjes website. 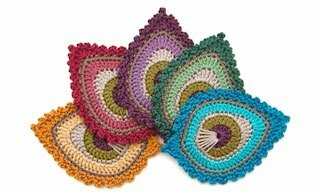 "Crochet is more than a craft. It is a lifesaving panacea, a necessary creative outlet, a calming tool and a rewarding passion. Sometimes, all we need is a little ball of yarn and a crochet hook to make us happy." *These are affiliate links. I will receive a small commission at no extra cost to you if you purchase a kit through these links. 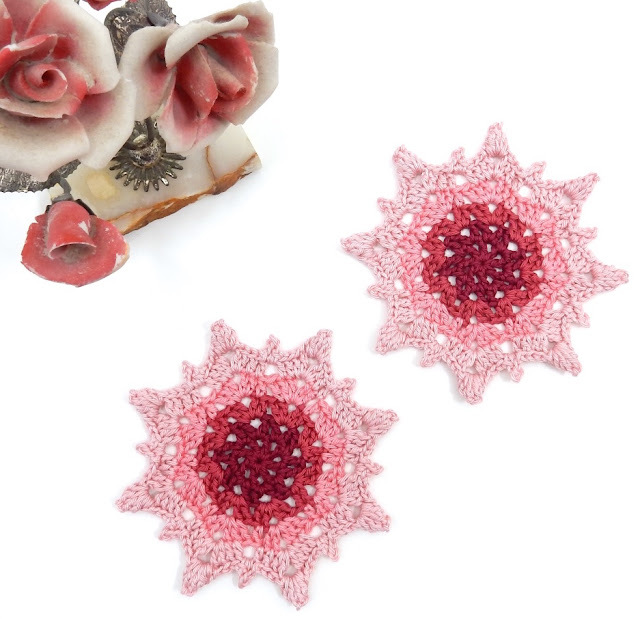 Last week I selected some teeny tiny 10g cutie pie Catona balls (I can come up with even more adjectives for these yummy, fun and addictive small balls if necessary ;-) for a little project and today I have the free pattern for you! I designed a crystal motif that you can use as coasters or as Christmas ornaments. They would look lovely in white and you could make a very festive garland with perhaps a touch of glitter. I myself went for coasters as I never really decorate much for Christmas. I love ombre tones so I chose 4 sets of 4 colours to create a fading effect. The pattern is written in US crochet terms but below you'll also find a table with the UK equivalents. The pattern is available in Dutch too. For the Dutch version, please click here. Popcorns consist of 5 dc. 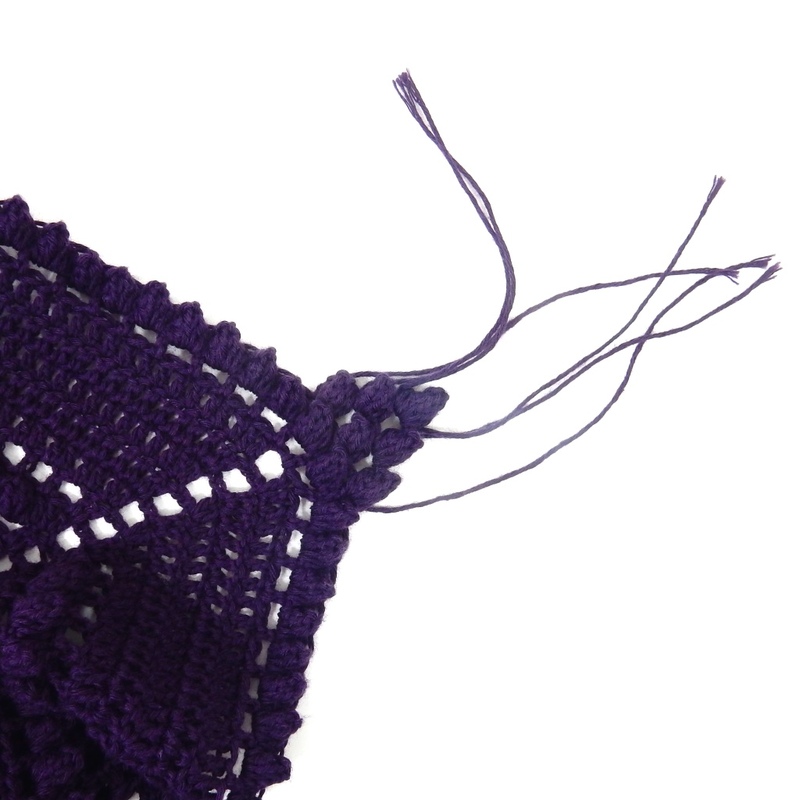 The picot 2 is made by slip stitching into the second chain from the hook. Slst in each of the next 2 dc, (slst, ch2, popcorn, ch1, slst) in next ch-2 sp, *slst in each of the next 4 dc, (1sc, picot 2, 1sc) in space in between next 2 dc, slst in each of the next 4 dc, (slst, ch2, popcorn, ch1, slst) in next ch-2 sp; rep from * all around and end final rep with slst in each of the next 2 dc, slst in first slst. To get the most beautiful result, the motifs needs blocking. For blocking you can use Styrofoam and pins, but you could also put a towel on your ironing board and pin them onto that. Spray with some water and let dry naturally. *Thanks to Scheepjes, who supplied the yarn for me to use. As always, any opinions expressed are my own. The affiliate links in this post supports giveaways, free patterns, discounts and the running of this blog. By purchasing yarn through these links, I will receive a small commission at no extra cost to you. Thank you! 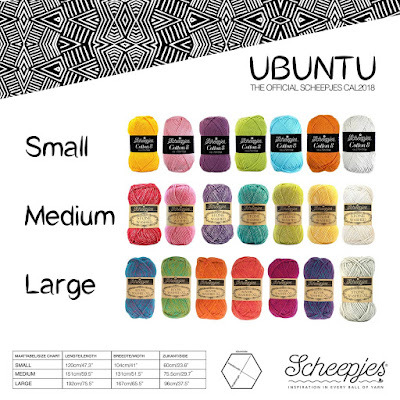 SCHEEPJES CAL 2018 Order your kit now! There are 3 different kits for 3 different sizes. I made a new kit! This one is for the popular Peacock Tail Feather Coasters. The kit is now available in my Etsy shop. If sold out, please send me a message to pre-order one from the next batch. 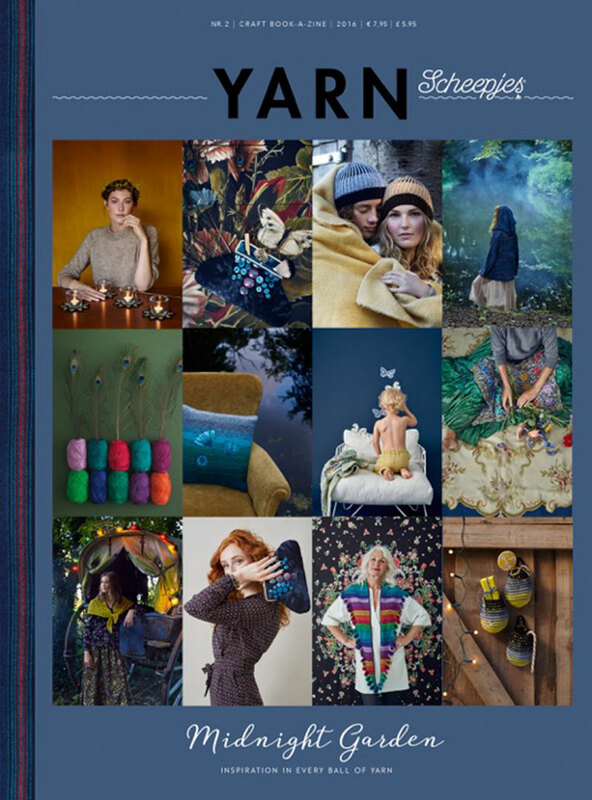 YARN 5 book-a-zine OUT NOW! 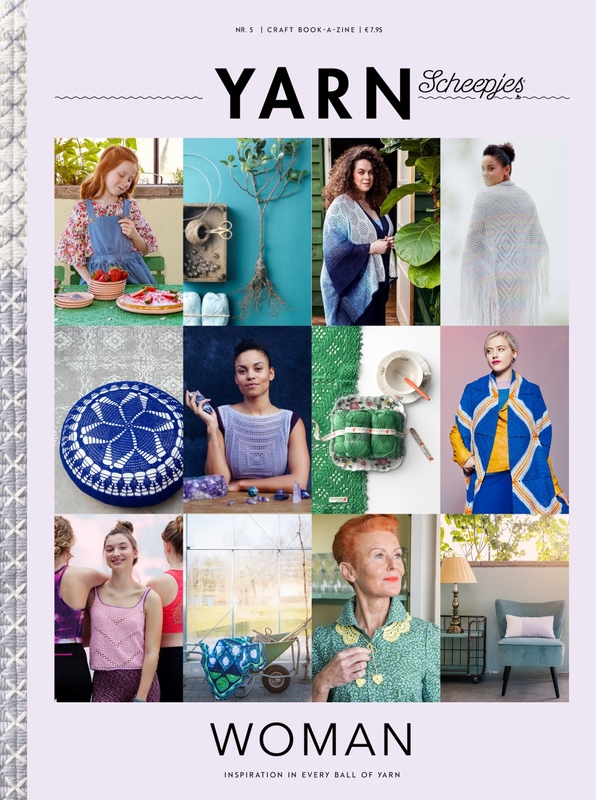 I work with a small number of carefully selected affiliate programmes and sponsors to be able to publish free patterns, organize giveaways and offer discounts. Shopping via these links will support all of this at no extra cost to you. Thank you so much! © TheCurioCraftsRoom. Design by FCD.